Solid timber flooring is the premier flooring product, achieving a beautiful warm decorative appearance for much longer than any competing product. Timber is truly renewable. Our solid timber is a natural product that comes from sustainable forest operations. Timber products recycle carbon from the atmosphere and our locally produced solid timber has a lower carbon footprint than any competing product. Purchasing and installing a solid timber floor is doing the right thing by the environment. A solid timber floor is an assurance of long-lasting quality. Solid timber is hard wearing, and even once faded and worn, a fresh new surface can be produced by sanding and recoating. No other product can boast this, the alternatives all require replacement of the whole floor once its attractiveness is lost to the ravages of time. Solid timber floors really are the premiere flooring product available on the market. Even denting and marking in a solid timber floor adds to the character, which mellows with age. Purchasing locally sourced solid timber supports your local community. Workmanship, pride and skill goes into producing and laying a quality solid timber floor. Support local rather than offshore factory production and gain the green credentials you deserve. Solid timber flooring timber is available at the marketplace. 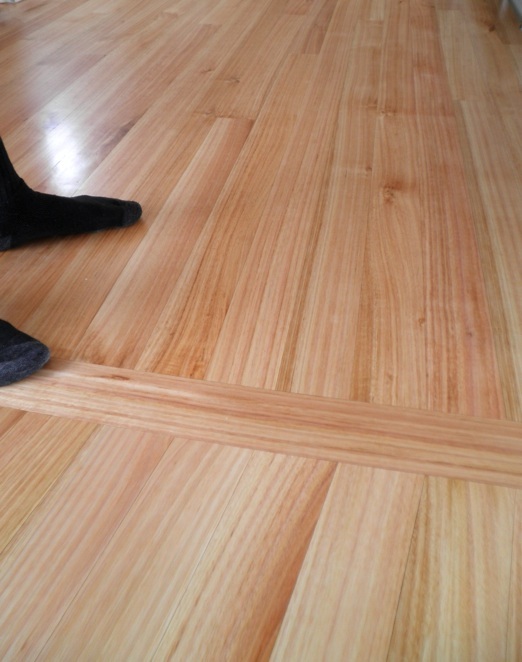 Solid timber floors come in two types, overlay and strip floor. Both are tongue-and-grooved but strip flooring is thicker (usually 19mm) for laying over joists or battens. Overlay flooring is laid over a solid substrate such as particle board and is usually finished to 12mm thick. Width of flooring planks varies but is commonly 85mm or 125mm cover. Wider floorboards move more in service. This means they can open up in dry summer conditions and close in damper winter conditions. Although natural for timber floors to do this, narrow floorboards should stay tighter. The building must be closed in with the internal environment as it would be once the building is in service. This will reduce changes in the flooring timbers equilibrium moisture content. The equilibrium moisture content will vary depending on the conditions within the building. Air conditioned buildings have a very low EMC so flooring should be laid at low moisture contents. Timber should be kiln-dried prior to laying and ideally "conditioned" by filleting the timber for 2-4 weeks inside the closed-in building where it is being laid. Installation moisture contents should be around 10-12% for intermittently heated buildings and 8-10% for air-conditioned buildings. Regional variations also need to be taken into account. Drier areas such as Canterbury may require drier timber than humid areas. Consult your local flooring expert about local conditions. The moisture must be right. If too high, shrinkage will occur resulting in cracks between floorboards. If too low, the floor can expand and buckle upward. Do not store kiln-dried timber for any length of time because it will regain moisture from the surrounding air, especially in a moist or humid environment such as a recently laid concrete floor. If stored for short periods wrap the timber in pallet-wrap and store on bearers well off the floor. If laying a floor directly over concrete ensure the concrete pad is well dried. This may take several months. Battens can be fixed to the concrete and the timber nailed to this, so the timber can be laid "tight". A timber floor glued directly to a concrete substrate cannot be held tight with nails. The cost of at timber floor will vary between around $100-$300 per square metre for the timber, laying, sanding and coating. Check out the marketplace for timber prices and get a quote from your local flooring specialist. With the right equipment and know-how, most people could lay a floor, but sanding and sealing are best done by professionals. End-matched flooring reduces waste and cuts cost when laying floors over joists. The ends/joins can be slotted together with out having to join the flooring directly on top of a joist. Solid timber flooring is available at the marketplace. Polyurethane is hard-wearing and inexpensive. Non-yellowing higher quality polyurethanes are available for lighter-coloured timbers. Hard oils (oils which polymerise and set) give a nice appearance but because the coating is quite thin it may not be as hard wearing as polyurethane. Silver beech, black beech, hard beech. Eucalyptus regnans, E. fraxinoides, E. delegatensis. Softwoods are not generally recommended for flooring because they lack surface hardness. Where a hard wearing surface is not required honey coloured species include farm-totara, macrocarpa and the slightly paler lawsons cypress. Poplar is a soft blonde timber.